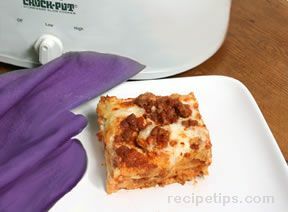 In a large skillet, cook the ground beef; then let it cool slightly. Stir in the spaghetti sauce and the cottage cheese. 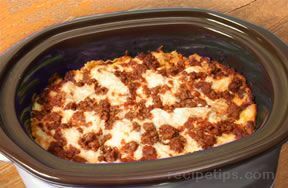 Layer the ingredients in the slow cooker in the following order: one-fourth of the meat sauce; then one-third of the lasagna noodles and one-third of the mozzarella cheese. 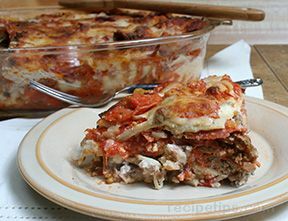 Repeat until you have 3 layers, finishing with the meat sauce on top (4 layers of meat sauce). Cook on the low heat setting for 6 hours. A few minutes before serving, top with more mozzarella cheese if you wish.